• FULL PROTECTION • - Your safety is our main concern. 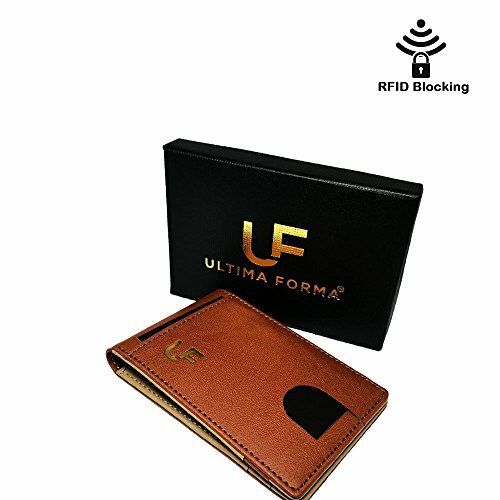 Therefore our sleek & stylish wallet is equipped and lined with advanced RFID secure technology thus blocking electronic pickpocketing and identity theft by unauthorized individuals who seek to scan your credit cards, debit cards, banking & personal information. Protect your valuable information today! • PREMIUM FUNCTIONALITY • - Your Ultima Forma wallet not only offers premium security, it also offers you a slim and lightweight design able to hold between 8-10 cards and bank notes with the integrated money clip. Offering quality & convenience whilst tucked away discreetly in your pocket, it is simply the perfect replacement for those outdated bulky wallets. • IDEAL FOR ANY OCASSION • - Designed with your needs at heart, the sleek minimalist design provides an elegant and refined look ideal for anyone & any situation. Whether you\'re an outgoing or reserved individual, an avid traveller, or use public transportation to get around, this wallet combines practicality with security. Have the perfect wallet for those social interactions and leave a lasting impression. • THE PERFECT GIFT • - Share this as a gift with any loved one; especially on birthdays, Christmas, graduation or other special occasions. They will not be disappointed with this essential gift everyone needs in their collection. • OUR WARRANTY • - Purchase now, risk free. Our warranty covers any defect or unpleasant shopping experience. We can offer you a full refund or free replacement, whichever is at your most convenience. No questions asked. A slim, neat compact wallet!